Fringe Maybe? 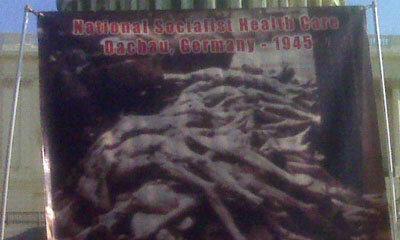 Health Care Reform and Dachau. An image (via dailykos.com) of a banner at today's Republican Party sponsored and attended protest against health care reform in the capital. Keep in mind that this wasn't some Glenn Beck-organized 9/12 stunt. This was an event staged by the House Republican leadership -- actual elected officials, members of the U.S. government. Other Republican members of Congress were on stage, too: Minority Leader John Boehner (OH), Minority Whip Eric Cantor (VA), Roy Blunt (MO), Jeb Hensarling (TX), Cathy McMorris Rodgers (WA), Michele Bachmann (MN) -- who was a key organizer of the event -- Virginia Foxx (NC), Ginny Brown-Waite (FL), Jean Schmidt (OH), Sue Myrick (NC), and many more. If Republicans wonder why most Americans view them as part of the fringe extreme, they need not look beyond this event. While Democrats were touting the endorsement of AARP, Michele Bachmann and the House leadership were rallying amidst signs like this, shoulder to shoulder with 2,000 teabaggers. This week, I claimed that the pro life event I attended last Saturday, complete with rubber fetus models, potatoes shaped like fetuses and a giant paper-mache image of the cartoon character Umberto the Unborn, all struck me as fringe. I received a lot of flack for it from "pro-life" groups. That these groups and gatherings are warranted so much media attention, credibility and influence over public discourse is outrageous and, frankly, a sad chapter in the history of our media and our politics. The nation's most prominent organization for seniors is expected to formalize its endorsement of the House health care reform bill today. The backing from AARP for the bill, which includes massive abortion funding, comes despite concerns about death panels and assisted suicide. The House is expected to vote Saturday on the bill and, when it does, it will have the backing of the powerful seniors group. "We started this debate more than two years ago with the twin goals of making coverage affordable to our younger member and protecting Medicare for Seniors," said AARP CEO Barry Rand in a written statement. "We've read the Affordable Health Care for America Act and we can say with confidence that it meets those goals with improved benefits for people in Medicare and needed health insurance market reforms to help ensure every American can purchase affordable health coverage," Rand added. But, pro-life advocates can say with confidence that the bill also presents a myriad of concerns for seniors. The new bill, H.R. 3962, contains the controversial "death panels" panned in the previous legislation and direct taxpayer-funded promotion of assisted suicide in the states where it is currently legal. HR 3962 contains two clear end-of-life provisions -- including one that requires insurance companies to distribute advance directives and other planning tools to all who are insured on the new government-run exchange. The other allows Medicare reimbursement for optional end-of-life planning consultation. Both provisions appear to exclude assisted suicide from the consultations and advance directives, but those exclusions have no meaning in the Washington and Oregon (and possibly soon in Montana) where assisted suicides are legal. There, state law says that "death with dignity," the legal terms in those states for assisted suicide, does not actually constitute assisted suicide. In both states, state law says actions under the assisted suicide statute "shall not, for any purpose, constitute suicide, assisted suicide, mercy killing or homicide, under the law." As a result, in Washington and Oregon, Medicare reimbursed consultations could involve assisted suicide planning and advance directives or other planning materials distributed by mandate could include assisted suicide options. Thus, taxpayer-funded information provided under both provisions will include assisted suicide options in those states where it is legal. If Steven Ertelt or other conservatives were to read the Death with Dignity bills in Oregon and Washington, they would find that both require that the patient bring up Death with Dignity. Doctors are prohibited from doing so. And in my prior blog, I note some of the issues, using GeriPal's post, of how our current system locks the elderly and the terminal into methods of end of life care that they don't want, that are costly, and that are inflexible. Best practice panels, so-called "death panels" guarantee a standard of patient care that is currently unregulated. We accept that the government protect us from unsafe work standards, water, manufacturing practices and other corporate excesses. Why not regulate health care? And elders are most susceptible to a bloated and paternal medical industry. Flaming fear among elders by protesting AARP and other senior organizations and by denouncing a bill that will only improve senior care is wreckless, irresponsible, and inhumane. The use of lies to feed care concerns among seniors only hurts them. The Chilling Effectiveness of Men's Rights Groups. RADAR’s rhetoric may seem overblown, but lately the group and its many partners have been racking up very real accomplishments. In 2008, the organization claimed to have blocked passage of four federal domestic-violence bills, among them an expansion of the Violence Against Women Act (VAWA) to international scope and a grant to support lawyers in pro bono domestic-violence work. Members of this coalition have gotten themselves onto drafting committees for VAWA’s 2011 reauthorization. Local groups in West Virginia and California have also had important successes, criminalizing false claims of domestic violence in custody cases, and winning rulings that women-only shelters are discriminatory. Medical Industry Regulations and Practical Care Challenges. A gentleman I see on housecalls with hospice has clearly stated his desire to not be hospitalized. With his level of frailty and the excellent palliation through hospice, this didn't seem to be an issue until his nephrostomy tube came out. While he has been preparing himself to die within a matter of months, he wasn't ready to die from urinary obstruction and renal failure in a matter of a few weeks. His first great grandson had just been born. We had a long discussion and he chose to have the nephrostomy tube reinserted. With the hospice medical director's agreement, I made arrangements for him to be transported to the local hospital for the procedure. Our plan was to transport him in, have the tube replaced, and to bring him right home where he had excellent caregiving. Unfortunately, in order for the hospice to be reimbursed for this intervention, he had to be admitted as an inpatient for an overnight stay. My patient asked me why he had to stay overnight. It reinforced for me how ludicrous some protocols and requirements are under current DRG/inpatient-driven reimbursement processes. As such, what could have been a simple, cheaper, more patient-friendly few-hours event was drawn out into a more costly, more resource-heavy, and assuredly less patient-friendly 24h stay in a hospital. Similarly, another patient I care for with dementia recently fell and broke her hip. After a series of discussions with the family,orthopedic surgeon, and anesthesiologist, we agreed on non-surgical management to preserve what cognition she has left as she was, remarkably, having minimal pain from her fracture. The care plan for convalescence and subsequent rehabilitation to teach slide board transfers and possible weight-bearing transfers after 6 weeks was discussed with the orthopedist prior to discharge. It took considerable coaxing and authorizations for us to arrange for the SNF as they at first declined since hip fracture rehabilitation is normally only covered post-surgery. And, now safely convalescing at the SNF, the patient is being asked to see the orthopedic surgeon to get an "OK." The situation leaves me frustrated on multiple levels: a) orthopedic surgeons understandably don't make housecalls/SNF visits and so this would require gurney transport to clinic, b) we had already made decisions for non-surgical care and the orthopedist had 'signed off' in the hospital so an outpatient visit to the orthopedic office was rather useless in this situation, c) that rehabilitation-potential is defined so narrowly for our frail geriatric patients that they must have surgery after a hip fracture rather than considering the potential that non-fixed hip fracture patients may still have to sit up, slide, or transfer into wheelchairs for mobility and to interact with others. Patient's experiences with illness are fluid. But care delivery is (literally) broken--and, frankly, often seems haphazard. How would it be if we reformed health care delivery to truly be patient-friendly, to provide care in the settings patients wish to be in (especially when it is feasible and cheaper!) and to reduce the divide we have created over time between inpatient and outpatient care? What if we dispelled regulations that require patients to have "qualifying stays" in the hospital or qualifying procedures in order to access the myriad intermediate and home-based options that exist and could be better integrated to care for our patients? I've repeatedly pushed the idea that giving patients more flexibility of choice was one way to combat resource challenges and rationing. We've been given regulations by the medical industry that limit both flexibility and choice because of "best practices" procedures implemented not necessarily with the patient's best interest in mind. The fractured system decreases our quality of care, raises over-all costs, and most importantly, limits patients' choice of care options. Mennonites and Health Care Mutual Aid. Compared to the national problem of 46 million Americans without health insurance, the Mennonite clergy’s problem might seem insignificant. The denomination has fewer than 100 pastors without health insurance. But the attempt to ensure that all Mennonite pastors have health insurance regardless of salary or the financial status of their congregation presents a microcosm of the larger health-care debate: Are the wealthy willing to pay more to ensure that everyone has health insurance? In this case, the question michigan auto insurance quotes is: Will larger churches be willing to subsidize smaller ones so that all Mennonite pastors can have heath insurance? The plan under consideration is called the Corinthian Plan, a reference to 2 Corinthians 8:14, in which Paul urges that the abundance of some should be used to provide for the needs of others. (”In turn their plenty will supply what you need. Then there will be equality.”) Under the plan, every pastor will receive essentially the same coverage–with a range of choices for deductibles–and larger and wealthier congregations will subsidize smaller congregations in order to make premiums affordable for all. Because many Amish have chosen to work in construction, lack of liability insurance has caused municipalities to challenge their right to such jobs. I would venture that most Mennonites today have insurance of all sorts (home, car, health), and there are Mennonite run insurance plans now, but that was not always the case. Anabaptists, the sect of faith to which the Mennonites and Amish belong, have long shunned modern health insurance in favor of "mutual aid" plans that assist those who suffer catastrophic injuries or illnesses. Amish and Old Order Mennonites still eschew private corporate insurance for their own assistance plans, church aid, or community support. November is National Hospice Month. More than 35 percent (35.4)of patients served by hospices in 2008 died or were discharged in seven days or less reports the National Hospice and Palliative Care Organization. This reflects a 4.6 percent increase from 2007, when 30.8 percent of patients had what is considered a short hospice experience. Patients and families receiving care for seven days or less are often unableto take full advantage of the range of benefits that the hospice interdisciplinary team provides. These benefits include psychosocial support and spiritual care for patients and their families as well as pain management and symptom control. While the average length of service increased from 67.4 days in 2007 to 69.5 days in 2008, the jump in patients receiving care for a short time is of concern to hospice providers and NHPCO. Only 12.1 percent of those served died or were discharged with service of 180 days or more. As our nation's population continues to grey, this is an alarming, costly, service-limiting, inhumane trend, a profound example of neglect of end of life care..
And an aside:  Oregon state, where Death with Dignity has been legal since 1994, boasts one of the most robust and advanced hospice and palliative programs in the country. Proof perhaps that a fact-based and direct approach to patient choice in dying works best for elder and terminal patients. No Rest for the Wearying: The Lavish Abuse of Michael Schiavo. Michael Schiavo remains a boogeyman to many "pro-life" organizations and individuals, as proven by this extensive and tinged story in NorthCountryGazette. It has been very easy for those who disagreed with removing Terri Schiavo from life support to demonize Michael Schiavo as a disloyal husband, a liar and a cheat, a vain man in search of publicity. While I think there may be much truth to Schiavo's questionable character, most of the criticism he receives is for his non-compliance with fundamental or "tradition" ideas of family. The facts of the Schiavo case remain consistent. A woman was on life support in a persistent vegetative state (a diagnosis the Schindler family continues to contest, they prefer to say Terri was severely disabled) for 15 years. Some, including Michael Schiavo, the medical proxy for his wife, felt that the best thing to do was remove Terri from artificial nutrition and hydration (ANH). There's no doubt that both sides feel they were doing what was best for Terri. Legally, Michael Schiavo was her health care proxy. Opponents of assisted suicide (now legal in three states) will erroneously continue to use the case of Terri Schiavo as example of the "slippery slope" our "culture of death" is on. And their conflation of the case with assisted suicide, aid in dying, euthanasia, medical proxies, choice in dying, living wills, end of life consultations, and elder care choice will continue to be in part convolutedly based on the character of Michael Schiavo as representative of their opponents. New Study on Why Voters Believe Falsehoods. Of 49 people included in the study who believed in such a connection, only one shed the certainty when presented with prevailing evidence that it wasn't true. "I was surprised at the diversity of it, what I kind of charitably call the creativity of it," said Steve Hoffman, one of the study's authors and now a visiting assistant professor at the State University of New York, Buffalo. The voters weren't dupes of an elaborate misinformation campaign, the researchers concluded; rather, they were actively engaged in reasoning that the belief they already held was true. This type of "motivated reasoning" — pursuing information that confirms what we already think and discarding the rest — helps explain why viewers gravitate toward partisan cable news and why we tend to see what we want in The Colbert Report. But when it comes to justifying demonstrably false beliefs, the logic stretches even thinner. Such a campaign did exist in the run-up to the war, just as it exists today in the health care debate. "I do think there's something to be said about people like Sarah Palin, and even more so Chuck Grassley, supporting this idea of death panels in a national forum," Hoffman said. He won't credit them alone for the phenomenon, though. "That kind of puts the idea out there, but what people then do with the idea ... " he said. "Our argument is that people aren't just empty vessels. You don't just sort of open up their brains and dump false information in and they regurgitate it. They're actually active processing cognitive agents." Liberals aren't off the hook either, the study shows. And what happens in a democracy where certain segments of the voting public ignore facts in order to maintain beliefs in ideas that may be false? "I think we'd all like to believe that when people come across disconfirming evidence, what they tend to do is to update their opinions," said Andrew Perrin, an associate professor at UNC and another author of the study. That some people might not do that even in the face of accurate information, the authors suggest in their article, presents "a serious challenge to democratic theory and practice." Evidence suggests people are more likely to pay attention to facts within certain emotional states and social situations. Some may never change their minds. For others, policy-makers could better identify those states, for example minimizing the fear that often clouds a person's ability to assess facts and that has characterized the current health care debate. Hoffman's advice for crafting such an environment: "The congressional town hall meetings, that is a sort of test case in how not to do it."